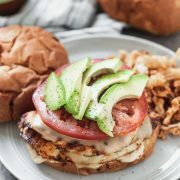 These Blackened Chicken Sandwiches with Chipotle Mayo and Gouda are the ultimate chicken sandwich! 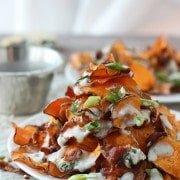 Spicy, cheesy and totally addictive! It used to be a running joke between my Mom and I, that when she would take me out to lunch it would cost her a small fortune. For some odd reason, I felt the need to order the full shebang every time – you know, appetizer, salad, entrée, and lest we forget, dessert. Also, I’m not talking typical lunch entrées such a turkey sandwich sandwich or small caesar salad. Nope. I wouldn’t put it past me to get the grilled fish of the day, a lean cut of sliced hanger steak, or an enormous bowl of handmade pasta. I think maybe I just felt like it would be sin to go to a nice restaurant and not try the “best” aka most expensive items on the menu, which means, I would NEVER even thinking about getting a sandwich for my main meal. I can pinpoint the exact day my attitude changed on the matter, and a good sandwich became a staple of my lunch diet. 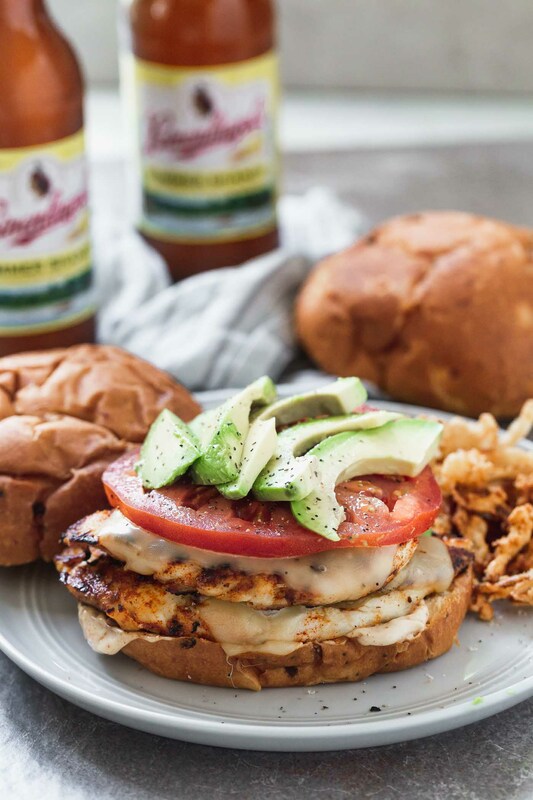 At a typical lunch with my Mom, I reluctantly split a spicy chicken sandwich with her and after one bite of the blackened chicken breast smothered with gooey gouda cheese, a tangy chipotle mayo and crispy onion straws, my whole thought process on sandwiches at lunch changed. 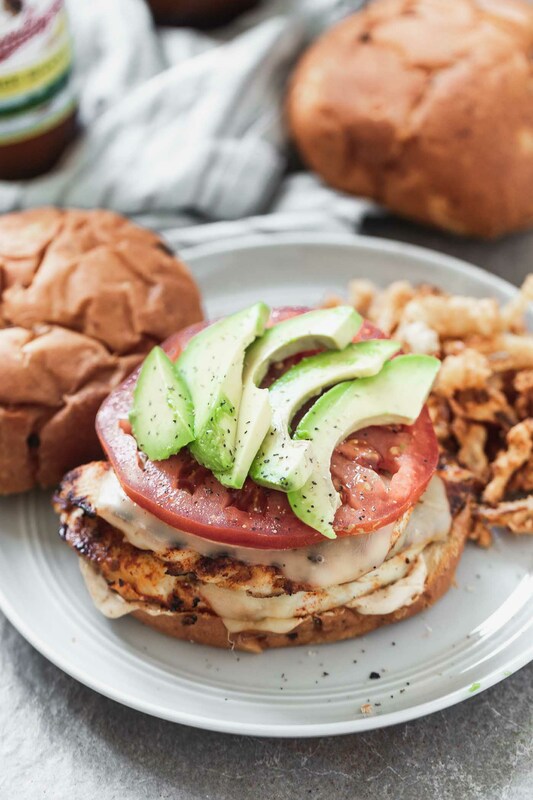 It was the best sandwich I’d ever had, and since that day I’ve been kind obsessed with grilled chicken sandwiches of any kind – as long as they’re piled high with thoughtful toppings and copious amounts of cheese, of course. The sandwich I’ve created today is pretty much an exact replica of the one that I love so much, and something I’ve made probably a hundred times since the day love struck. 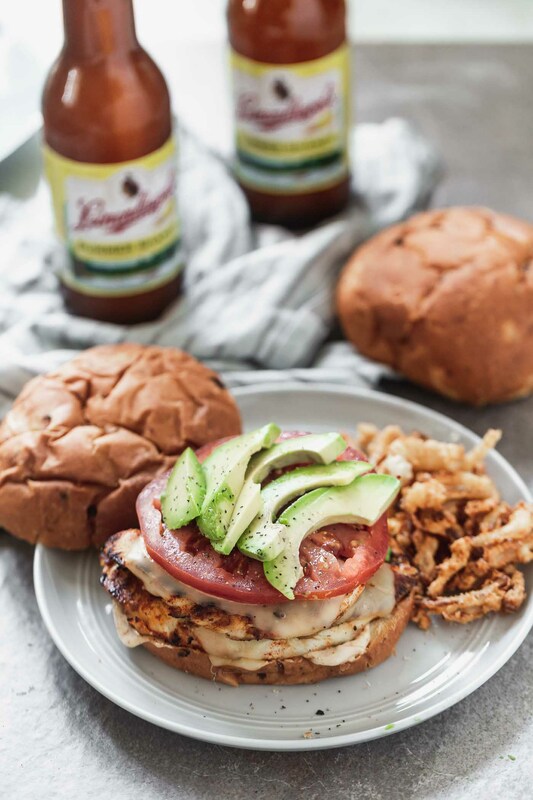 I love the idea of a double decker sandwich, so what I like to do before I cover the chicken in blackening seasoning is to flatten each chicken breast until it’s about a quarter inch thick. I then cut each breast in half so each piece is about the same size as the bun, leaving you the ability to have two layers of gooey cheese instead of one. 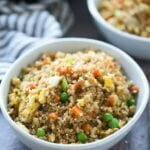 While you can easily use store-bought seasoning, I almost always have the ingredients in the pantry to quickly throw together my own. 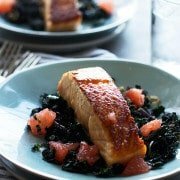 I’ll even make a double or triple batch so I can store the leftovers and pull it out to season fish, or veggies for dinners later in the week or month. Everyone has their own version, but mine has lots of garlic powder, paprika, a touch of smoked paprika, cayenne pepper, oregano, onion powder, plenty of salt and in this version, chipotle chili powder. Next essential part of the ensemble: chipotle mayo. 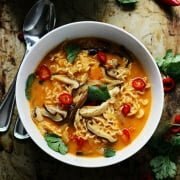 This could not be any easier and it’s SO delicious. 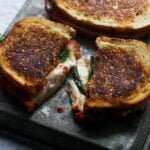 I love to slather it on this sandwich, of course, but I also love to use it for fish tacos, as a spicy dip for roasted shrimp cocktail or even slathered on the bread of a simple turkey sandwich to give it a little pizzaz. The beauty of it, is there’s only three ingredients – light mayo, chipotle chili powder and lime juice. That’s it! And a little bit of salt, of course. 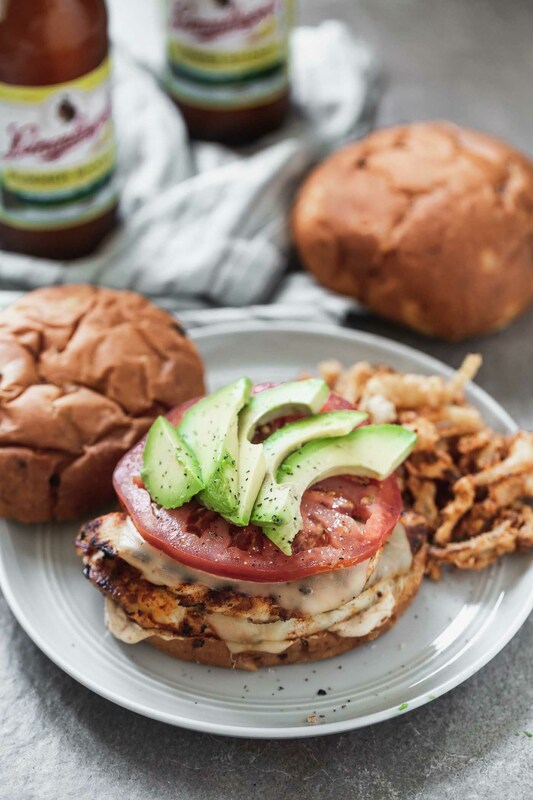 I quickly cooked some fried onion straws when we had these most recently, but honestly, the blackened chicken with the cheese, chipotle mayo and other toppings is enough to make this an unforgettable sandwich, so don’t feel guilty skipping them. I like to serve on toasted, buttered onion buns alongside a big green salad and some crispy baked French fries. The perfect summer dinner! In a small bowl, mix together, paprika, garlic powder, onion powder, black pepper, cayenne pepper, dried oregano, 1/8 tsp chipotle chili powder, smoked paprika and salt. Using a meat mallet or rolling pin, flatten chicken until it's about 1/4-inch thick. Cut each breast in half so you have 8 pieces. Season both sides of chicken with seasoning. Heat a cast-iron skillet or grill to a medium heat. Cook chicken about 4-5 minutes per side until cooked through. 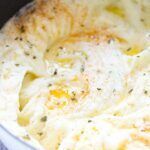 If using a cast-iron skillet, you may need to work in batches. While chicken is cooking, add mayo, lime juice, and remaining chipotle chili powder together in a small bowl. Season to taste with salt and pepper. Set aside. Once the chicken is cooked, top each breast with a piece of gouda. Add a couple teaspoons of water to the skillet and cover for 10-15 seconds until cheese has melted. Slather both sides of bun with mayo. Top with two pieces of chicken, followed by a slice of tomato and half of an avocado. Season avocado with salt and pepper. If using, top with onion straws. One Response to "Blackened Chicken Sandwiches with Chipotle Mayo and Gouda"
Now I have hunger pains.